Both pumpkins and apples are fruits of the harvest, but somehow pumpkins won out over apples as the iconic symbol of Thanksgiving and fall. Maybe it’s a size thing? Whatever the reason, I am equal opportunity tablescaper, so I decided that this year’s Thanksgiving table would feature both of these quintessentially autumnal fruits. And since my dining room is decorated in a palette of greens and burgundies, I thought I’d create a tablescape using a color scheme of brown, burgundy, white and green. My linen tablecloth which I bought at an estate sale years ago (and frankly is slightly stained), was not very visually interesting. To liven it up, I employed my favorite trick of using different widths of burgundy and brown grosgrain ribbons to create a plaid pattern on the plain white damask cloth. This is a great way to create a custom look for your table. 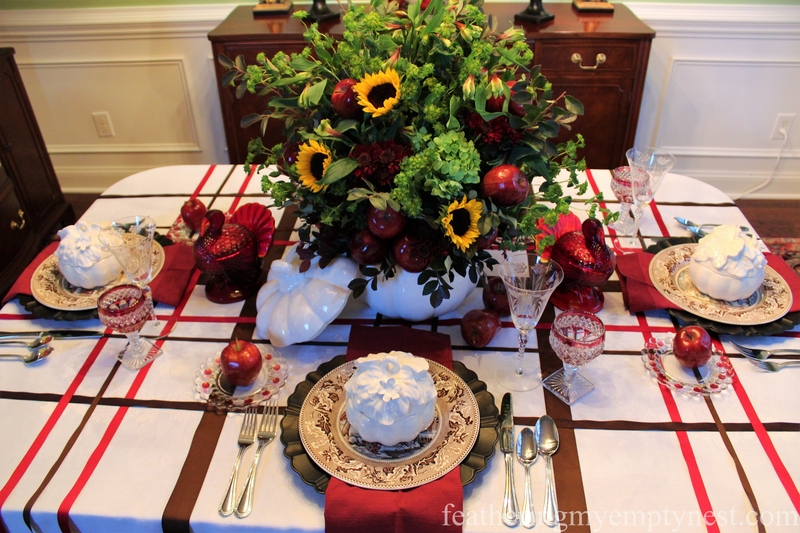 You wouldn’t believe how hard it is to find a burgundy and brown plaid tablecloth when you are looking for one! I chose to build my table around these charming vintage Johnson Brothers Thanksgiving Historic America, “Frozen Up” dinner plates. They have a beautiful border of brown acorns and oak leaves surrounding a center, which depicts a red and brown “Over The River And Through The Woods” snowy scene. We don’t get much snow in the Piedmont of North Carolina, so I have to live vicariously through the guy on my plates. 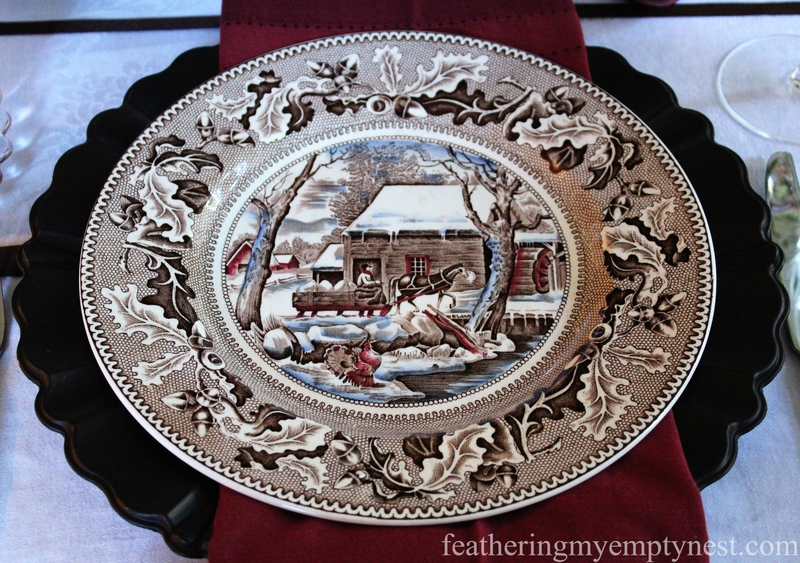 I wanted to place the transferware plates on dark brown wood chargers, but when I priced ones I liked, they were prohibitively expensive– costing $20 and up. I ended up buying much cheaper antique ivory melamine chargers from Pier One and painting them brown with Espresso gel stain. 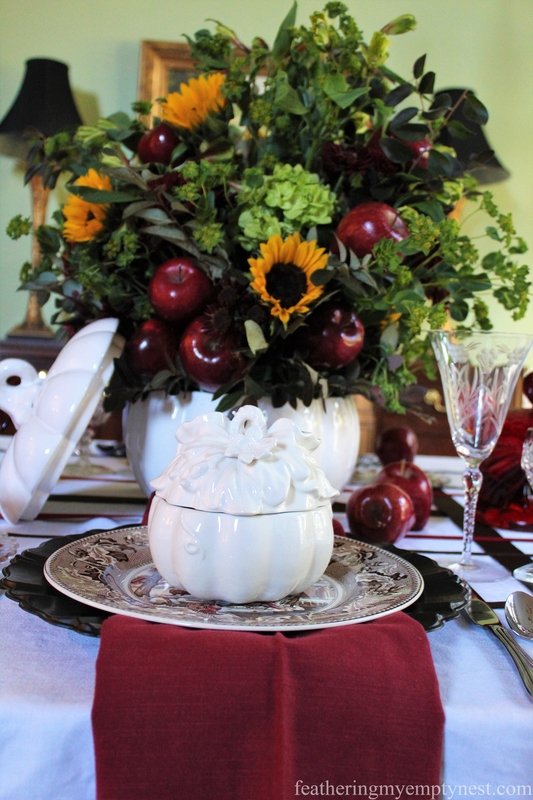 On top of the plates, I placed pretty little white pumpkin tureens with lids that are embellished with flowers and vines. Hemstitched linen napkins bring more burgundy into the place setting. 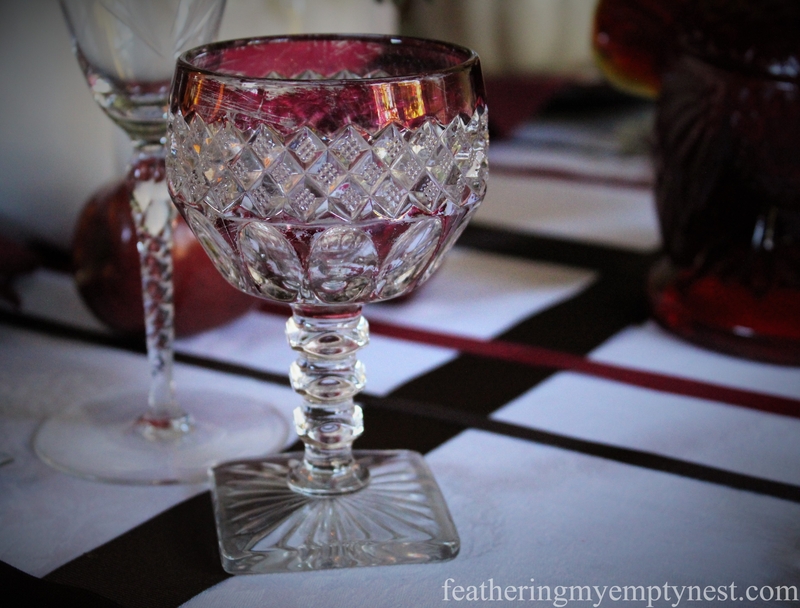 And antique ruby goblets and butter plates, also add more color and sparkle to the table. 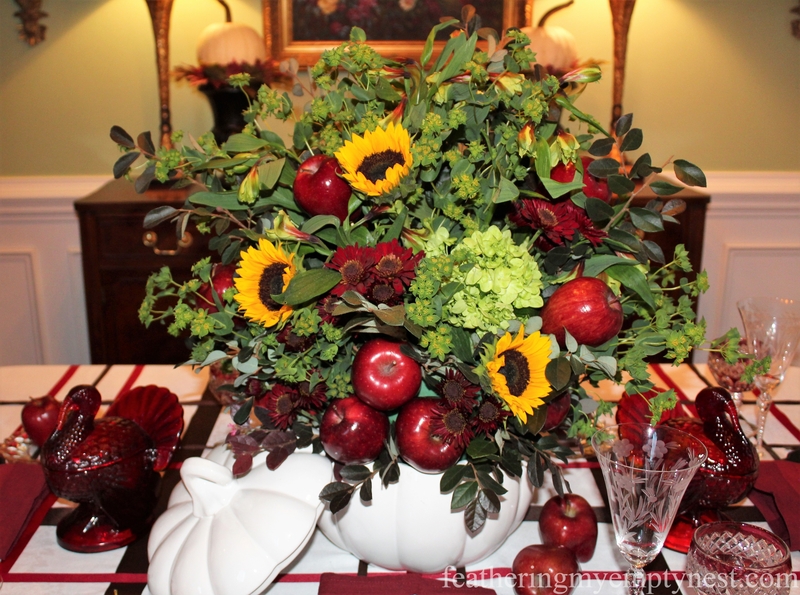 For the centerpiece, I arranged sunflowers, Red Delicious apples, burgundy mums, green hydrangeas, and alstroemeria in a large white ceramic pumpkin tureen. 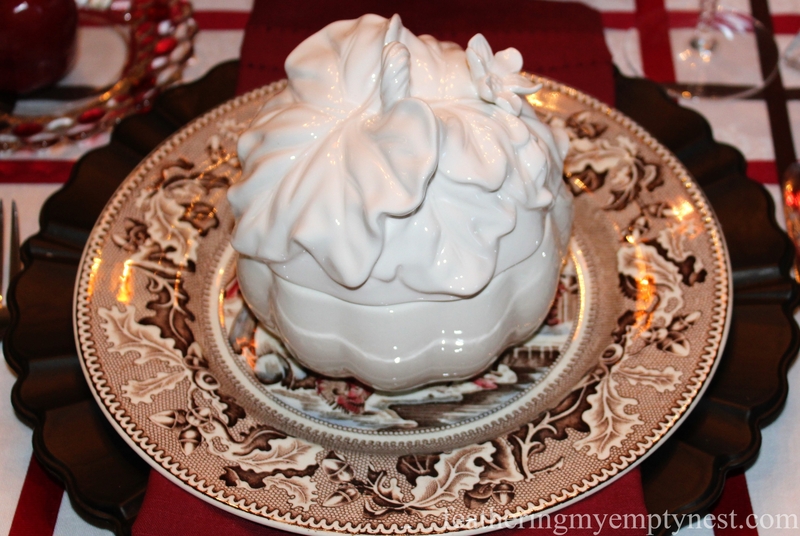 I purchased the large tureen from Michaels at a deep discount because the accompanying ladle was broken. 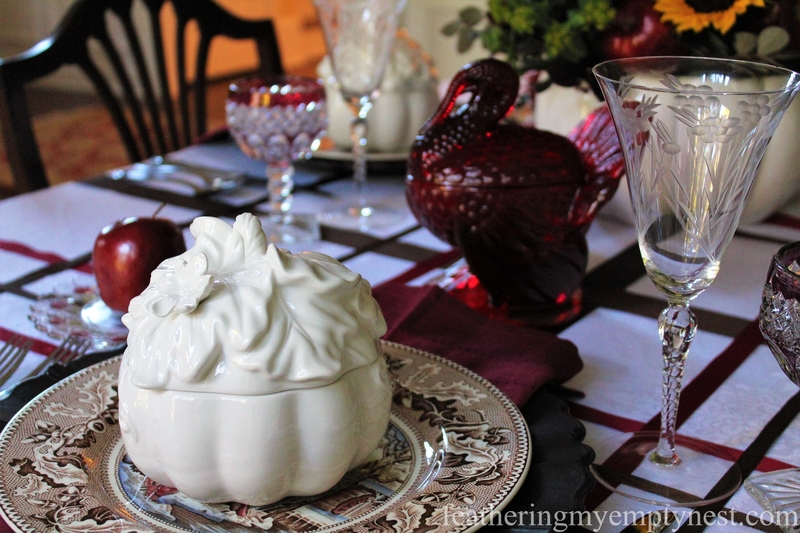 A pair of vintage red pressed glass turkey candy dishes complete the tablescape. 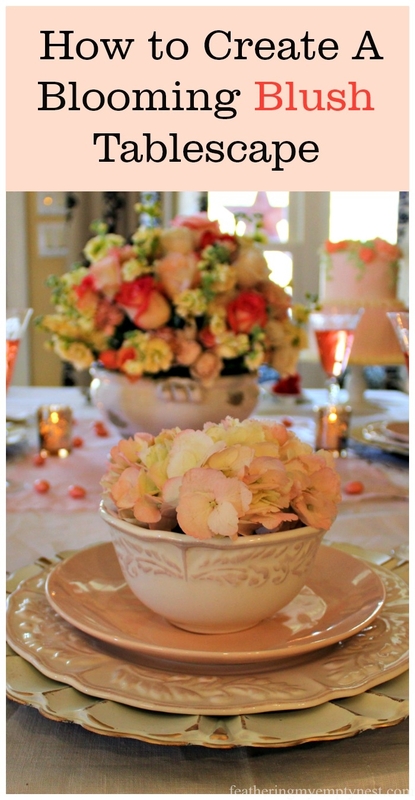 I love the way the tablescape turned out. I think the red apples really pop next to the white pumpkins. 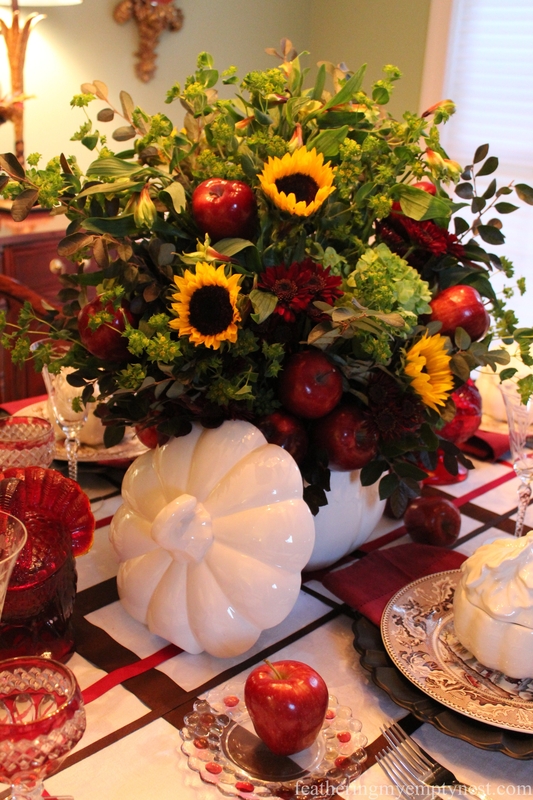 So, this year, don’t discriminate–consider giving apples equal billing with pumpkins on your Thanksgiving table. Really lovely table. In the spirit of the season, but still fresh and original. Equal representation for apples! Thanks so much for your kind comment. Apples should get equal representation. After all, what is more American than apple pie? Wow, it’s beautiful and I love that ribbon idea! Thanks very much for your kind comment on my tablescape. I hope you have a wonderful week! Larr, what a great idea for sprucing up the tablecloth – with ribbons! I love your plaid. In fact, I really love this entire tablescape. You know what is really fetching to me? Those blood red turkey candy compotes. That color is so rich. Your centerpiece is gorgeous too. I am crazy about tablescapes, period, and this one speaks to me. Thanks so much Rita. I really appreciate your kind comment on my tablescape. I am also delighted that you have subscribed to the blog. I promise to do my best to continue to produce posts you will enjoy. I hope you have a great week too! What a beautiful table! 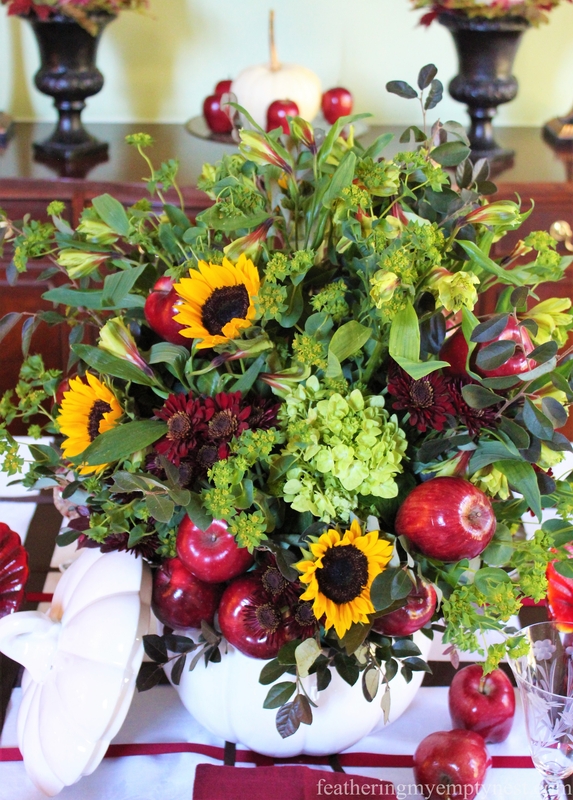 Perfect for Thanksgiving…and that centerpiece is phenomenal! 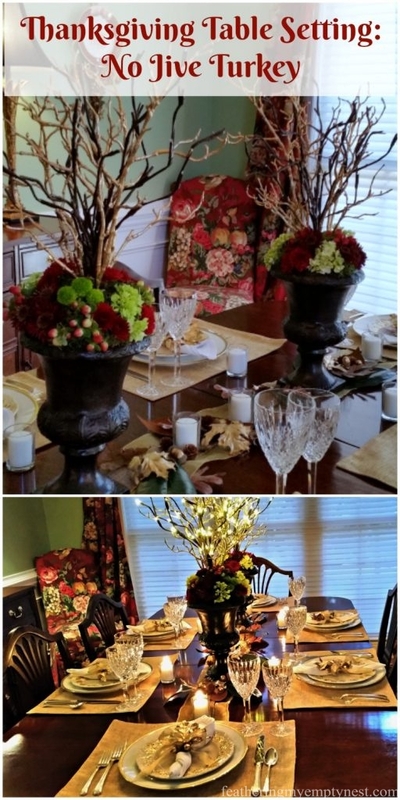 Thanks so much for your kind comment about my Thanksgiving tablescape. I really appreciate it! Beautiful table…and the use of ribbons is genius! Also loved your idea of getting the less expensive chargers and transforming them to exactly what you envisioned…the floral centerpiece? … perfection!!! Thank you for your kind comment. I am glad you liked my ribbon trick. 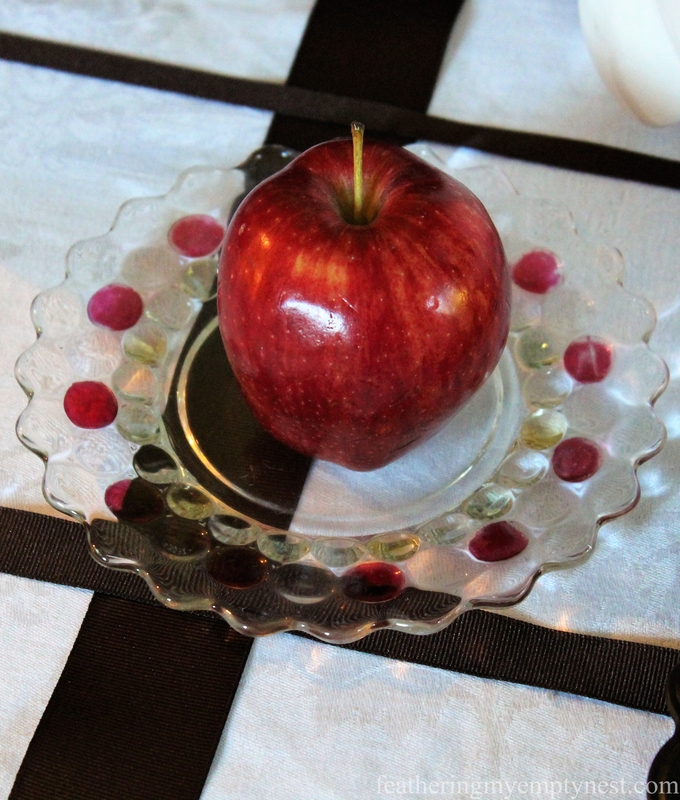 I’ve used it many times in the past to add color and pattern to an otherwise plain tablecloth. 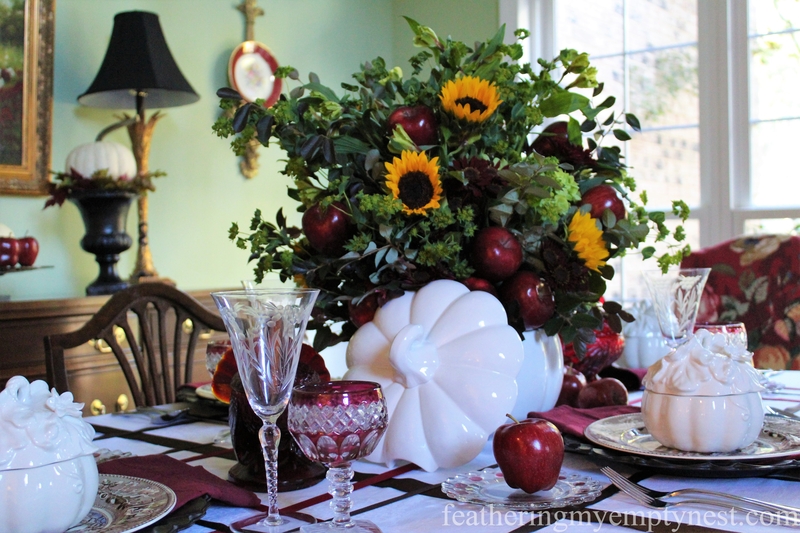 That centerpiece is gorgeous and the apples are so perfect for it. I was also having a hard time finding a plaid tablecloth in burgundy and brown. Your solution was a cost saver. I ended up buying a couple yards of burgundy and tan plaid fabric that I will use as an overlay. Your table is beautiful and I hope loving memories will be created around it. Thank you so much for your kind comment. I am glad you were able to find some fabric in the plaid you were looking for. Necessity is definitely the mother of invention! Thanks so much Pam. 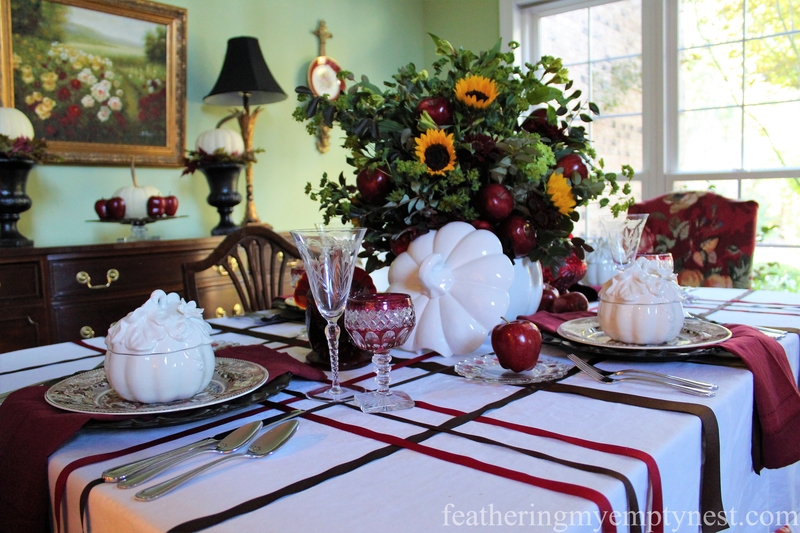 I love really love creating Thanksgiving tablescapes. I wish that I liked cooking the meal half as much! So Deliciously Gorgeous! 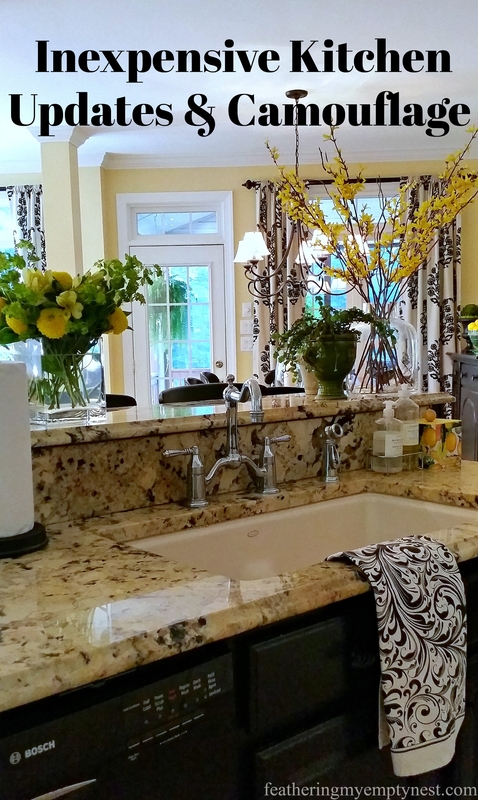 Everything from the beautiful colors to the tableware is just fabulous! 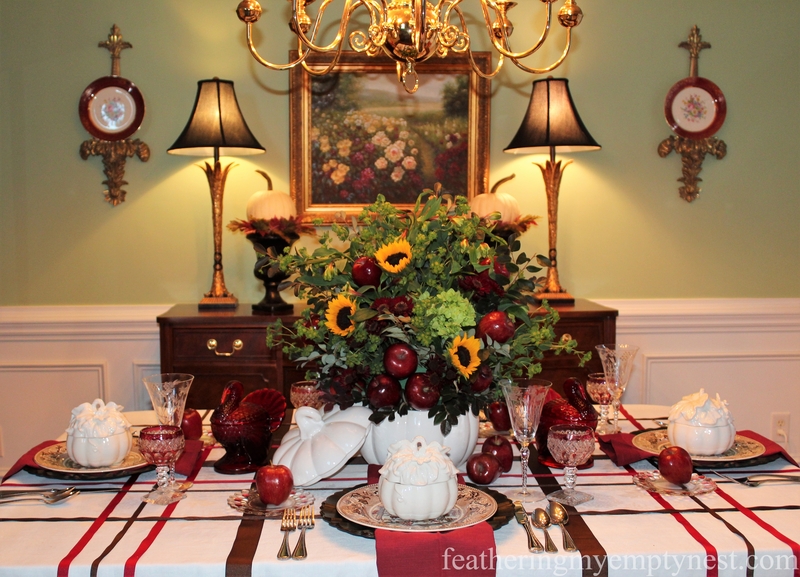 I love the plates…..the little Pumpkin soup bowls and the Burgundy Turkey Compote dish is like I’ve never seen! Must be vintage! Outstanding! 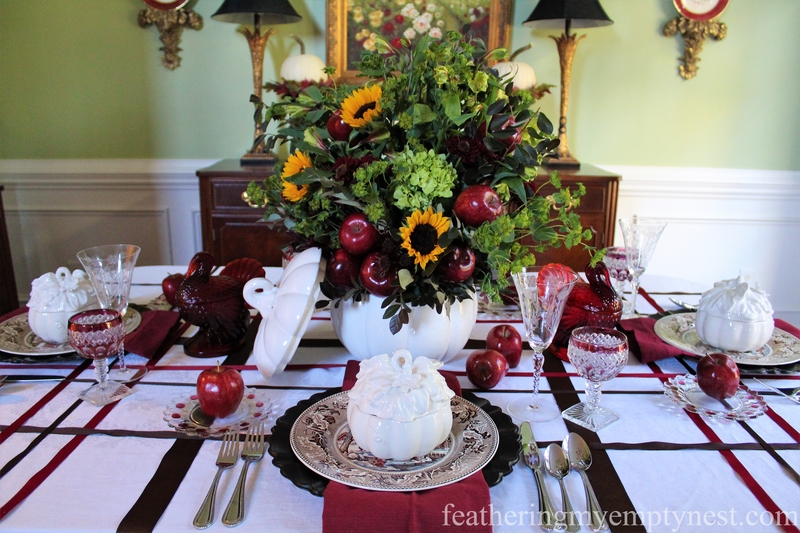 Thank you so much for your kind comment about my Thanksgiving tablescape. I really appreciate it! Thanks so much for your lovely comment, Michelle. I have used ribbon on my tables for years. It is an expensive way to personalize a plain tablecloth. Not only did we get to see your whole tablescape but you gave us great ideas that we can use to be creative and save money ourselves (like the chargers and the ribbon). Thank you for sharing your photos with us! Thank you so much for your kind comment about my tablescape. I really appreciate it!